Do you want to add an author’s photo in WordPress? By default, most WordPress themes display an author’s gravatar image as their profile photo. But what if you wanted to replace the gravatar image with an actual author photo? 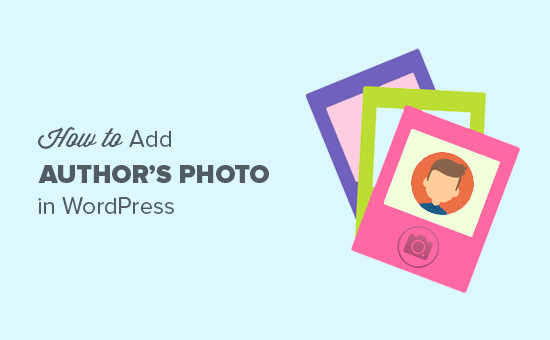 In this article, we will show you how to easily add an author’s photo in WordPress. 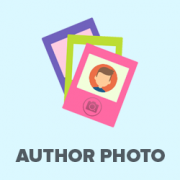 When Do You Need Custom Author Photo in WordPress? If you run a single author WordPress site, then you can just use an image widget to add your photo and an about page with more information. On the other hand, if you run a multi-author WordPress site, then you may need to add an author bio box at the end of your articles. Author bio box typically shows an author’s profile photo, brief bio, and links to their website or social profiles. By default, most WordPress themes display an author’s gravatar image as their author photo. However, sometimes an author may not have a gravatar image or they may not want to use it as an author image on your website. Having said that, let’s see how to easily add author photo in WordPress and allow authors to upload a photo to their profile. 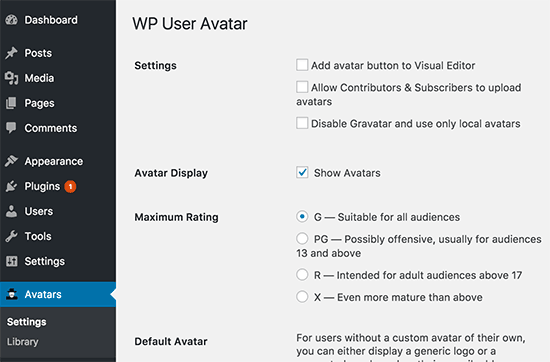 First thing you need to do is install and activate the WP User Avatar plugin. For more details, see our step by step guide on how to install a WordPress plugin. Upon activation, the plugin will add a new menu item labeled Avatars in your WordPress admin bar. Clicking on it will take you to the plugin’s settings page. 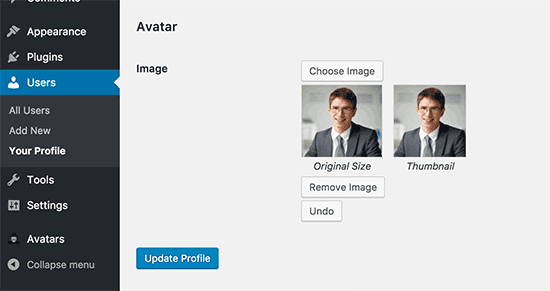 Here you can choose how you want to display the user avatars on your WordPress website. By default, this plugin allows users with at least an Author role to upload their own profile photo. You can change that and allow contributors and subscribers as well. It also allows you to completely disable Gravatar on your WordPress site and only use local avatars. Once you are comfortable with the settings, go ahead and click on save changes button to save them. Now you can go to Users page and click on the edit button below a username. On the edit user screen, scroll down to the bottom, and you will see the Avatar section. You can click on the ‘Choose Image’ button to upload the user photo. Similarly, users on your WordPress site will be able to upload their photos by editing their user profile. Now you can visit your website to see the plugin in action. It will start showing local avatar as author photo for the articles. If a user does not add an author photo, then it will show their gravatar image. If a user doesn’t have an author photo or gravatar image, then it will fallback to the default gravatar image. You can add a branded custom gravatar image to be used as fallback image. We hope this article helped you learn how to add an author’s photo in WordPress. You may also want to see our guide on how to allow users to submit posts to your WordPress site. Hi, i have a user registration page on which user registers as a contributor. Then he/she can submit blogs for moderation. However, on that registration page i want users to add their photos mandatorily so we don’t have to rely on them adding it later from their profiles or do the task ourselves. How to show avatar on the frontpage? This method only show on the loaded pages. Thank you! Been trying to work this out for ages!! If anyone else is wondering why your photo isn’t showing up in author bio, it may be because there’s also separate settings for the plugin itself. You have to check the box that says, “display author avatars”. At first all I did was went to the author settings and uploaded the photo not realizing that there was extra settings for the plugin itself. Doesn’t seem to show my picture. It uploads and shows in the Author page in Word Press but not showing on the actual site. Help! I am using this plugin on a site that also uses co-authors plus as some posts are written by 2 people, but this plugin only allows 1 author image to display, how can I amend the userphoto_the_author_photo() to display both authors images in 1 post? 32 being the size of the image but that’s optional. If you only want to add a picture of the author, this function seems better than a plugin. Thanks mate. I was actually surprised people go for a plugin instead of a function..
Is there a way around having to deal with Gravatar.com or whatever? It seems crazy it isn’t just a built in feature of WordPress. Just use gravatar! Tried this plug-in and was not satisfied. I don’t want the author photo pasted everywhere that there’s a post, multiple times on the site. No good. Awesome Plugin. Worked perfect immediately. Thanks!!! Thanks, but can we do it without any plugin? Simple Local Avatars is working fine for me. Thanks all. Thanks for sharing this info. However I am not sure if this is what I need. When I write a post on my website (http://juanmacarlupu.com.ar/blogdetraduccion) at the end of each post it says: “This article was written by: Juan Manuel Macarlupu Peña” and a default picture and mi bio. I have tried everything on earth (or that’s what I think) and I cant change that default picture. Can you help me with that? I would reaaaaaally appreciate it. I think it goes without saying that it worked! Can you help, I had this plugin working fine on a test site but not on the live site – the user pictures appear in the user back-end but not on the post or author pages? Does anyone have any ideas why this would happen? Extremely hard to tell without looking at the site. So I have to download the plugin to get the image to show on google searches, am I correct? I have everything else setup and linked with google+ profile, email verification etc. I was thinking the image would show up from my google+ profile. But it sounds like I need the WP plugin as well. Can you please confirm? Most WordPress themes come with Gravatar support. If your users are signed up with Gravatar, then their picture will show up. Like your picture did in this comment. No need of editing any files. Joey, that plugin you posted is useless and very broken. The User Photo plugin is the best one out there right now and works perfectly! Thanks Joey! Simple Local Avatars was awesome! For anyone downloading this plugin, there plugin settings are not in the “settings” or “tools” section. Just upload the plugin and go to the “Users” section. The upload form will be in the users information where you put the bio, email, and other social media contact info. Thank you! It realy works fine! The image is not displaying in all user lists. Can any one help ? @Sham You have to make sure that you have the php code to display the image in your template. We have a theme that has a registration/profile page on the front end. any idea on how to add the upload image option to the front end? thanks. I have successfully uploaded user photo plugin. Successfully imported image. But image does not display. What is missing? @ArsalanTosifi me also have the same problem. @Rahoof PM @ArsalanTosifi You do not have the code in your theme to display it. You have to add the user photo code. Click on the plugin page, they have the code there. Thank you for this post and plugin! I have been searching for something and am so happy to have found my answer! Any idea on how to integrate this with bbpress discussions? Nope. We haven’t really looked into bbPress yet. I have about 200 jpeg photossaved, and I would like to put them in the userphoto folder and have them become that person’s photo, and the user can come back and change it if they wish. I tested this out by placing a photo admin.jpeg in the folder, but it did not take effect. do you know how I can do a mass upload of photos for userphoto? You can’t just FTP stuff because the value is also stored in the database. It is better to ask all your editors to add the pictures by themselves. Yeah this is nice good wp plugin to share author’s picture. Thank you for highlighting this plug-in. Thank you, this is one thing that has stressed me out.